Paris, the legendary City of Lights, is the newest destination for University of Notre Dame College of Arts and Letters students who want to study abroad. Founded in 2007, Université Paris Diderot enrolls 26,000 students at its campus on the banks of the Seine in southeastern Paris. This neighborhood near the Bibliothèque Nationale de France has a distinct identity all its own—many residents are ethnic Chinese refugees from the former French colony of French Indochina (modern-day Vietnam, Cambodia and Laos) who speak Cantonese, Vietnamese and Khmer as well as French. Notre Dame students in the new Paris program will study in the university’s College of Letters, Arts and Cinema, which offers a broad variety of courses in French language, linguistics, literature, art history and film studies “from an excellent group of teacher-scholars whose profile compares well with ND faculty,” Douthwaite says. It may be possible to take courses in other fields as well. 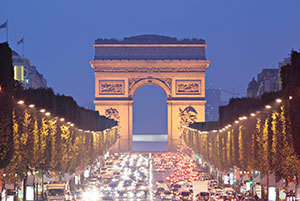 The program is meant to complement, not replace, Notre Dame’s other study abroad opportunities in France, including an intensive social sciences track at Institut d’Etudes Politique in Paris and the University’s popular, long-standing program at the Université Catholique de l’Ouest in Angers. Most students in the Angers program study at an institute within the university that is designed specifically to serve the needs of foreign language learners. As such, the Angers program is particularly well-suited for second-year students with intermediate levels of French, Douthwaite says, while the new Paris program is tailored to more advanced language students. Paris has been a capital of high style, art, cuisine and culture since at least the 17th century and has welcomed many famous American writers, artists and performers over the years, Douthwaite notes. With hundreds of museums, libraries, archives and world-famous monuments—as well as the premier sites of French government, education and finance—the city has much to offer advanced students seeking fluency, cultural immersion and intensive research opportunities. The deadline to apply for study abroad programs is Nov. 15 (Thursday). Originally published by Kate Cohorst at al.nd.edu on November 06, 2012.